The Sfakia region is the largest municipality on Crete. Located in the extreme south of Chania Prefecture, this natural wonderland was once home to over 40,000 residents. Today, the region has less than 2,000 full-time residents spread out over an area of 468 square kilometers. Situated about 75 km from Chania city, Chora Sfakion (Hora Sfakia) is the central village where nature lovers pitch their base camps in Spring and Summer, for exploring one of Greece’s most rugged regions. If exploring untamed nature or getting totally out of sight of the touristic throngs is your thing, Sfakia is the place to go on Crete. The wild beauty of the landscape, the mountainous backdrop, and the sparkling Libyan Sea make for a photo op you’ll never forget. 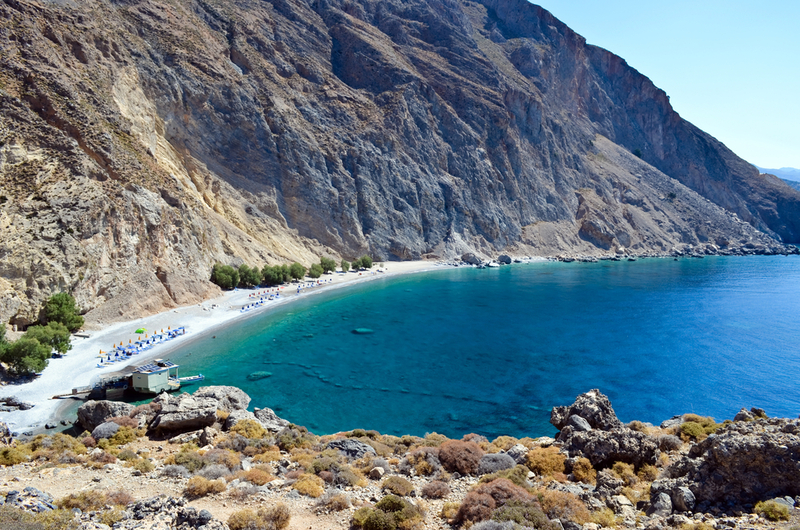 Sfakia’s Vrisi Beach, Iligga to the west, and Frangokastello to the east are amazing destinations for travelers in search of deep tanning and aquamarine dreams. But these are only the strands of beach you can reach by road, there are many others tucked away in coves where no car has ever ventured. We suggest you snag a fisherman or sea taxi and go to Marmara Beach west of Loutro, or perhaps Glika Nera (Sweet Waters) to the west of Chora Sfakia. You can also reach these and other secluded beachs along the E4 hiking route. is situated in the National park of Samaria, in the White Mountains in Sfakia’s center. A wondrous and mysterious place, the gorge it a moderate hike of 18 kilometers (5 to 7 hours) through the center of some of Crete’s most beautiful outback country. The gorge is open beginning in May, depending on the weather and the winter runoff from the mountains. Well maintained and with wardens to help trekkers along the way, Samaria Gorge is definately one of Crete’s “bucket list” attractions. Sfakia is heaven for hikers given the lay of the land and the multitude of available paths, gorges and the unmarked slopes of the amazing White Mountains of western Crete. Here there are 20 summits above 2,000 meters with the highest being Pachnes as 245 meters. 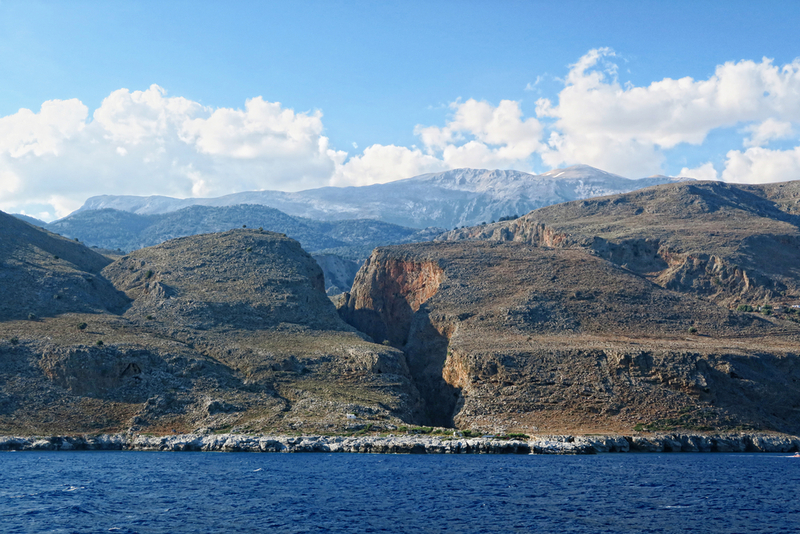 In Sfakia, the White Mountains are split by 18 gorges of as much as 1000 meters in height. Most of them exist since ancient times and have been created by goats and shepherds throughout the ages. These are called kalderími, but there are several classical paths from the Roman and Venetian occupation of Crete in the region as well. From the west to the east of Crete there is also the famous European long-distance walking path E4, which leads from Kastelli in the northwest to Kato Zakros in the east of the island, about 500 km long. Small chapel of Timios Stavros (i.e. Holy Cross). On the site where the chapel is built today, there was a Venetian fortress, ruins of which still exist today dispersed around the church. In northwest Sfakia near Aradena, the gorge of the same name is traversed by a bridge where bungee enthusiasts dive a distance of 138 meters tethered to the bridge. The Aradena Gorge is great for hiking too since it runs from the southern slopes of the White Mountains to the small beach of Marmara (a little to the West of Loutro). The walk is much shorter than through Samaria or other Crete gorges, but it’s also a more rugged trek recommended for more experienced hikers. While you’re in the area you’ll also want to check out the old stone path crossing the gorge at Aradena (one of several ancient paths crossing the gorge) is a spectacular example of traditional kalderimia (cobbled mule tracks). From Chora Sfakion to Agia Roumeli, where hikers emerge from Samaria Gorge, this region of Crete is a window through time to a way of life that has long since been lost elsewhere. There’s fabulous Loutro (above), which can only be reached on foot or by boat, and Anopolis in the mountainous heart of the region. Farther up the coast, the 14th-century Venetian fortress at Frangokastello is home to myths and legends, while Askyfou Plateau’s villages retain age-old traditions and culture. For history buffs, the War Museum of Askifou is a must-see attraction. 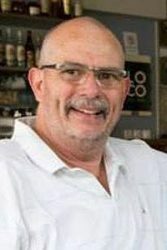 There’s also amazing Imbros in the gorge of the same name, and the beach resort town of Plakias, just to name a few of the larger villages and towns. Asfendou, Kallikrates and Agios Ioannis are interesting departures in time as well. 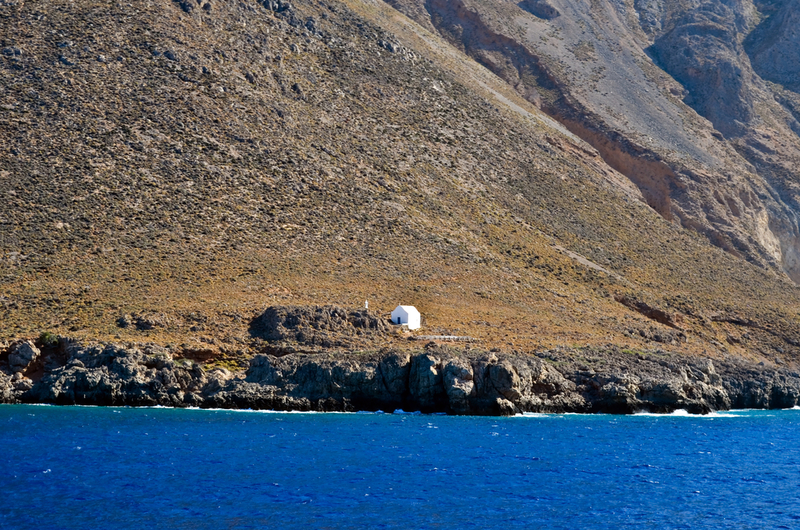 Sfakia is a land of spectacular, unspoiled, natural beauty. It is special not only for its pristine nature and remoteness, but because of the essence to be easily found. 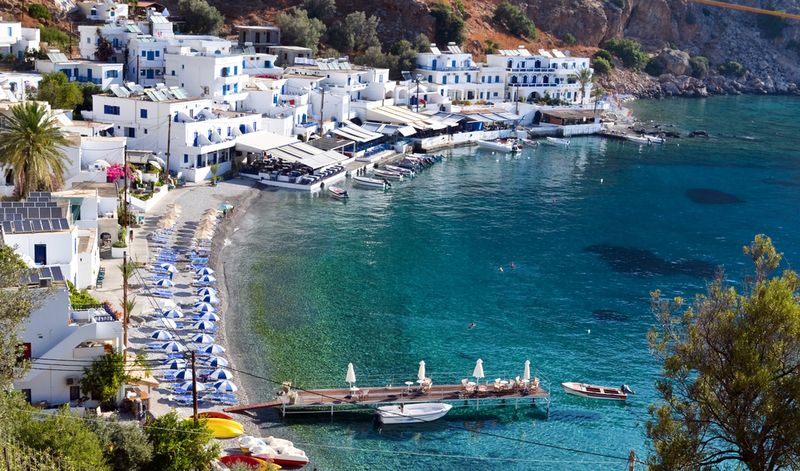 just ask any local about the legend of the Cicadas, and you’ll begin your journey into the real Crete. I leave you with a part of that myth. Most people are unaware there are 2500 species of cicada in the world, most of which still remain a mystery to scientists. The legend says the cicada insects shed their skins, live underground for long periods, and are then reborn as new “souls.” According to Homer’s Iliad, these spirits were once men who have undergone the cycle of birth, death, and rebirth. The myth talks about this metamorphosis and the fact that these reborn men are protected by the Muses so that they can attain a higher level of knowledge and existence. Aristotle embued cicada symbolism with the ideas of resurrection and immortality, and the little creatures live in Sfakia like nowhere else. By car, bus or taxi from Chania or from Rethymno and Heraklion the most accessible route to Sfakia is by turning off the National Road at Vrysses, headed south. From here you take the route is up and over the Lefka Ori mountain range through Askifou and Imbros, a pleasant and scenic journey of about 45 minutes. Next, you drive about 12 km farther south through Imbros Gorge to Chora Sfakion and all points beyond. You can reach the Sfakia Municipality by phone at +30 28250 91540-2, or by visiting this website.